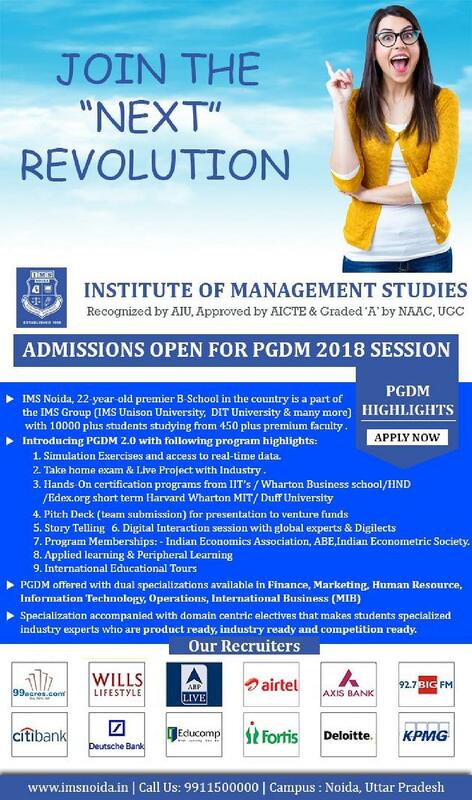 Institute of Management Studies, Noida, popularly known as IMS Noida, runs under the auspices of the Institute of Management Studies Society which is a non-profit making body and was established in 1998. 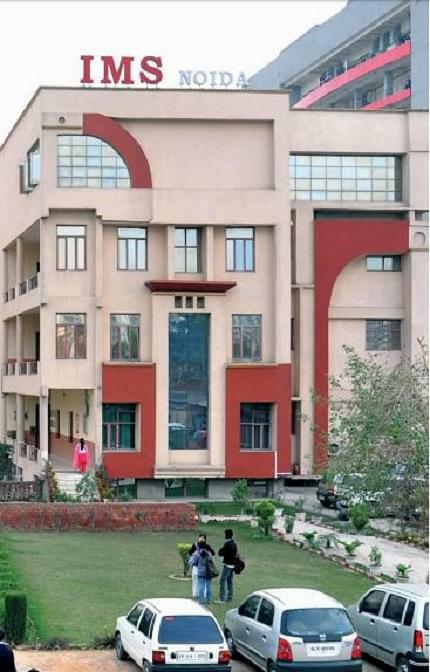 It is accredited by National Assessment and Accreditation Council (NAAC) with ‘A’ grade and affiliated with Chaudhary Charan Singh University (CCS), Meerut. The institute is approved by All India Council for Technical Education (AICTE) and the University Grants Commission (UGC). IMS Noida Admissions are based on Joint Entrance Test for UG Courses and state levels exams such as UPSEE/CAT/MAT/NMAT and others. 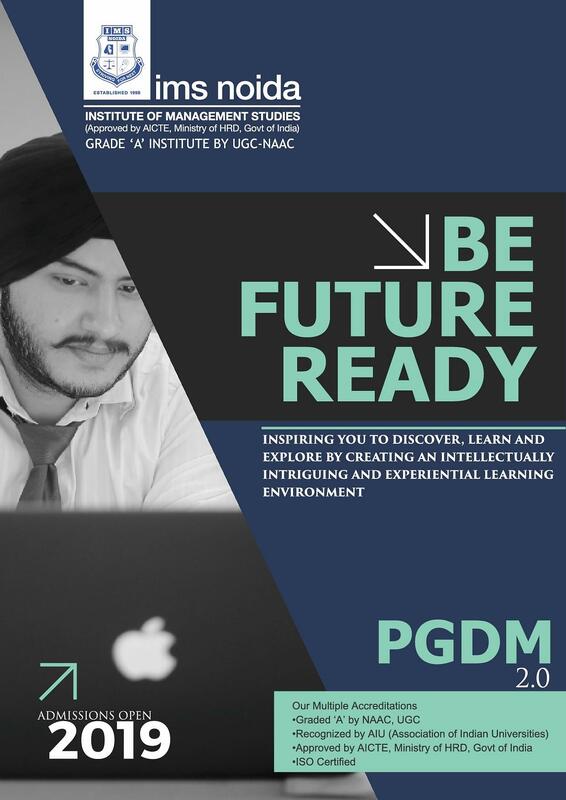 IMS Noida offers the variety of undergraduate and postgraduate courses in multiple specializations. 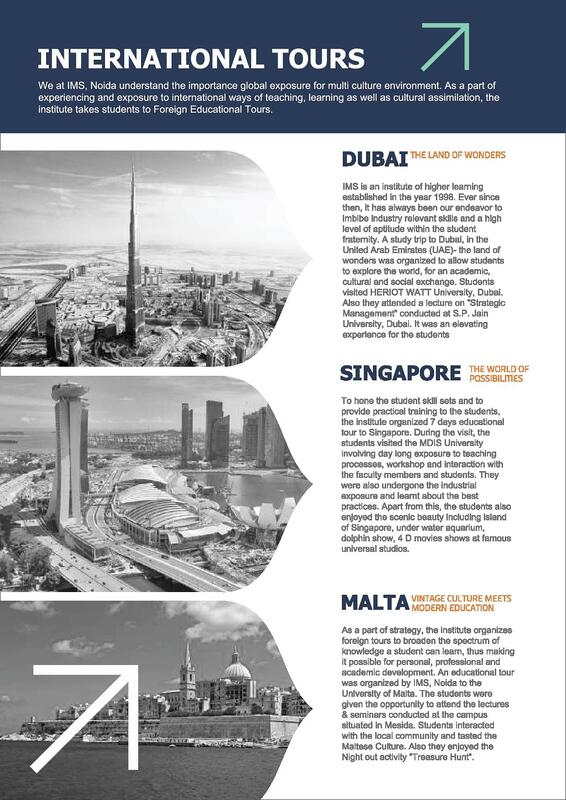 At the undergraduate level, it runs BBA, BCA, BJMC, BALLB, and LLB at the undergraduate level. 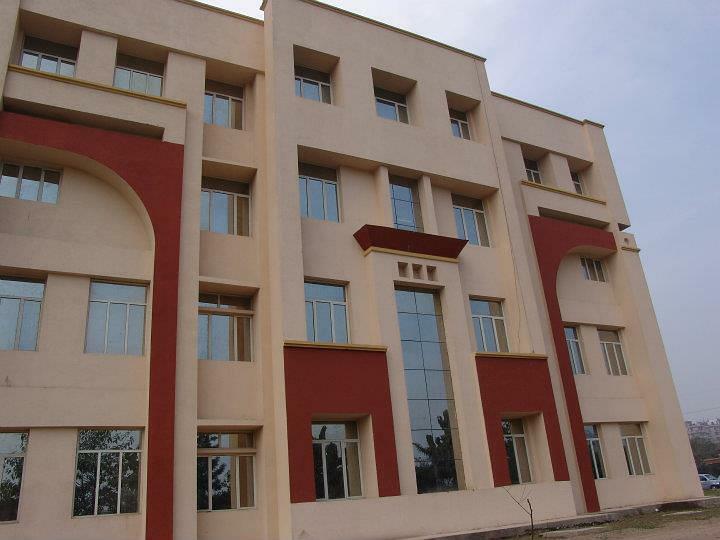 At postgraduate level, it provides MIB, MJMC and PGDM at postgraduate level. 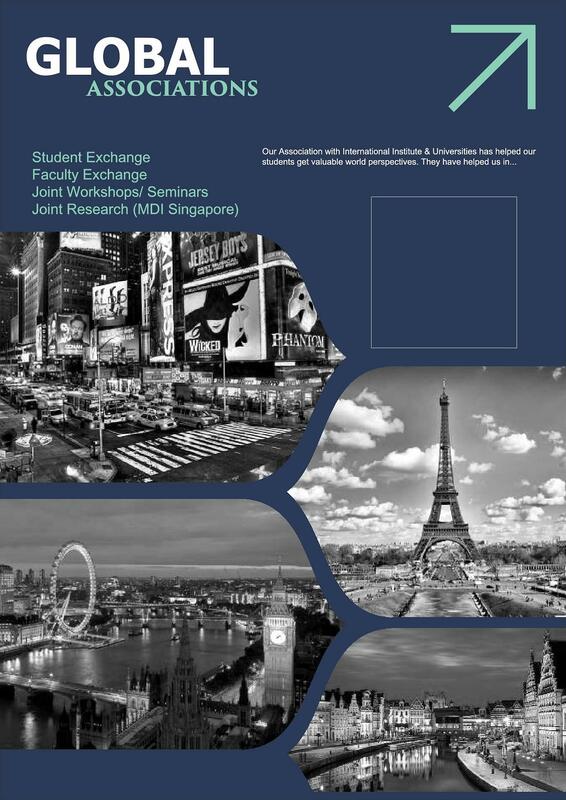 The duration of undergraduate and postgraduate courses. 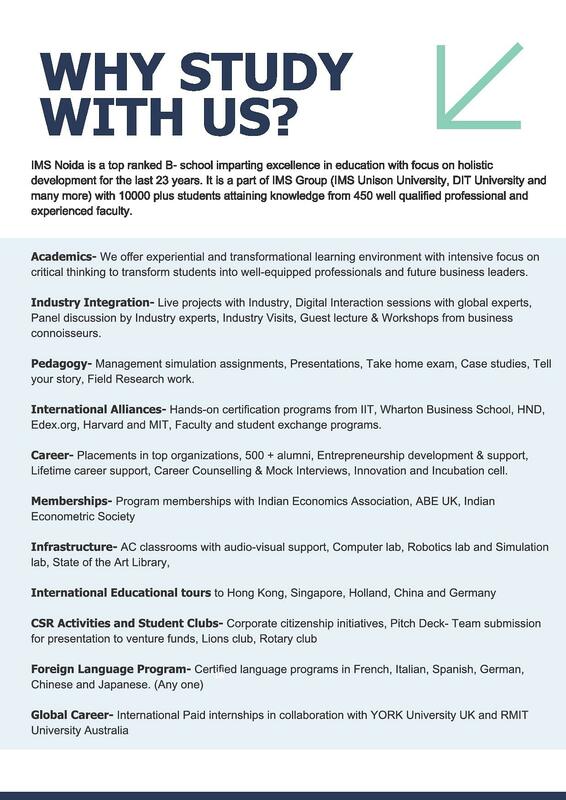 IMS Noida Fee Structure is varied for each program. Joint Admission Test (JET) conducted by the College followed by Personal Interview. Have a Bachelor’s degree in any discipline with not less than 45% aggregate marks. Candidate should be graduate in any stream with minimum 50% Marks. 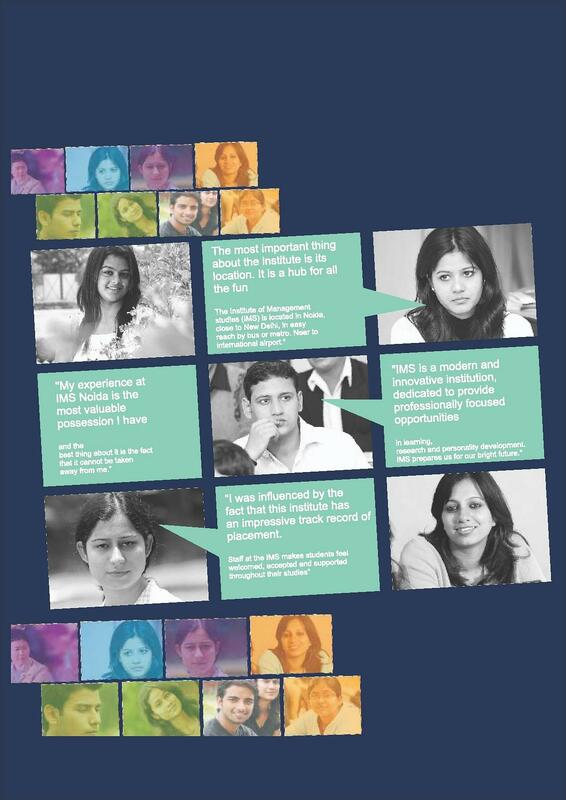 IMS Noida Placements are offered to all the candidates through its central placement cell. The cell works on overall development of the candidates before they appear for the final Interview with the recruiters. Workshops and Seminars are conducted to develop Self-Assessment Capability, Confidence, Soft Skills and Personality of each candidate. CITI Bank, SNAPDEAL.COM, BAJAJ Capital, Future Group and Aakash Educational Service Ltd are among the top recruiters at IMS Noida. Scholarships up to a value of Rs.40,000 per student are awarded to meritorious students annually. I would only say that if someone has talent then no one can stop him. College only proves us the way to achieve our dreams. the only bad remark for the colleges the campus is so small in the canteen is not so good as my expectation I thought they would be a good canteen but not in the name of canteen you get only samosa with chutney chilli potato Chinese food sandwich cold drink just all this things.. and after my one year completed these all also vanished... Now there is only one black coloured food truck standing there which sell snacks at higher rate I don't know why they do this..
My experience of 1st year. My college is not so good and not so bad enough is it good for studying if you want to study are you can enjoy the life with your friends bunk the class is go for parties anything you want to do. Hi Ritesh, yes you are eligible, for more information, please contact on 0120-4798800 , 4798801 , 4798802. 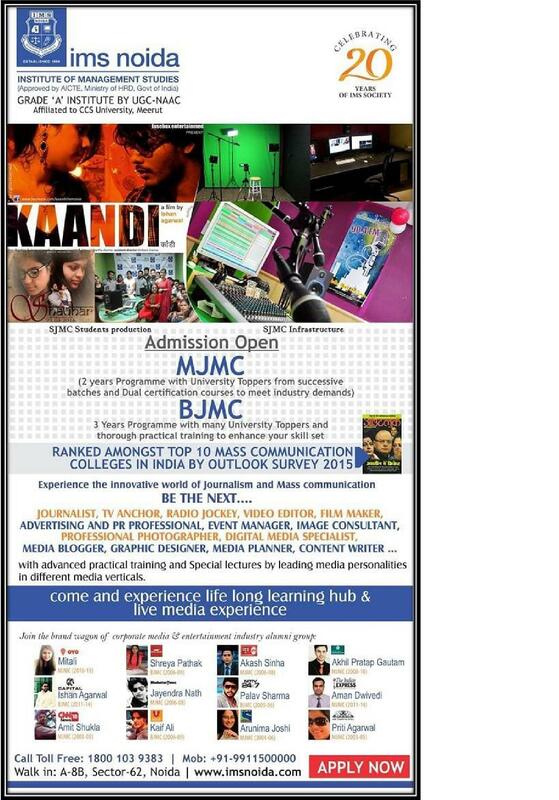 In this college whether MCA course is offered or not?? Hi, Surya Pratap For BALLB CLAT entrance exam is not valid but Joint Entrance Test (JIT) is compulsory for BALLB in this college and JIT is conducted once a year. 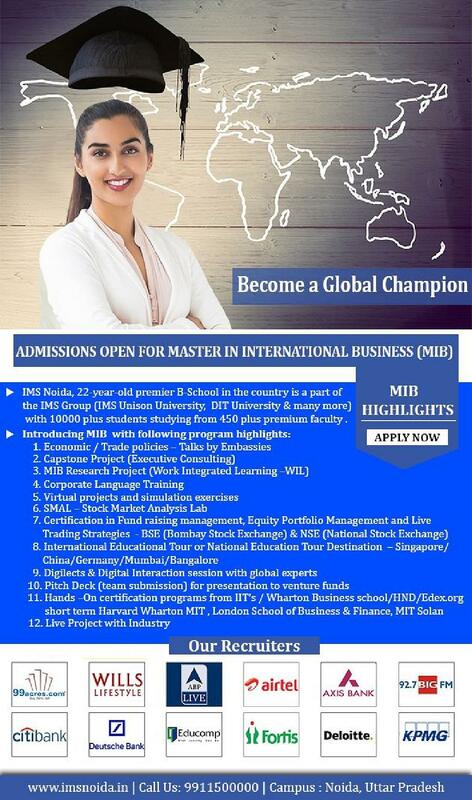 is MBA in HR is available or not?and also tell me the fee structure? Hi Kamna,` This College does not provide the MBA program in HR stream. I scored 65% in class 12 commerce without maths can I get admission in BBA course. Let me know the fee structure and hostel charges. 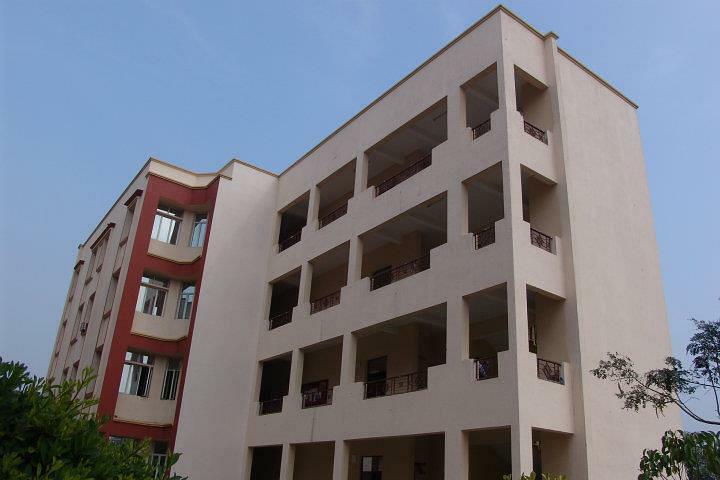 Hi Manav, Yes, you can apply for BBA course in this college and to get the fee structure please follow this link: Fee Structure . Sir,i am interested in doing bca from IMS Noida.please inform me whether i have to appear for an entrance exam or my class 12th marks in math and computer would be enough? Candidate should have Passed (10 2) or Higher Senior Secondary Certificate Examination from the CBSE or from the equivalent examination of any state / ISC recognized to it. He/She should have obtained a minimum of 50% aggregate marks. All SC/ST candidates have a relaxation of 5% in the minimum aggregate. Candidates should have completed 17 years of age as on 31st December of the academic year. hello.. 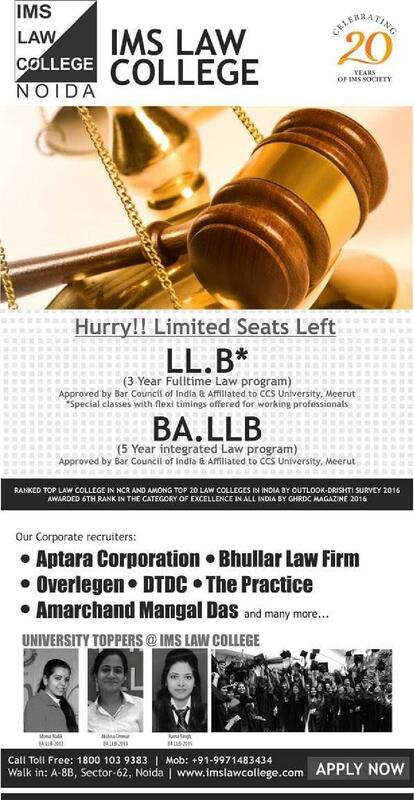 I would like to know more details regarding llb course of 3 years, Since I have already graduated. Sir, If I have failed in mathematics as additional subject, but still I passed my main subject Informatics Practices, Then will I be eligible for B.C.A Admission? "My experience of 1st year." No entrance exam needed for admission .you just have to score more than 50% in your board thats it and just formal interview taken by the teacher in the college pay the fees and you are in .i didnt get any college near by it is closest to my home that why opt for it..and some reason for opting are also the facility out near by college there is good environment pleanty of availability of everything Malls are there nearby for just roaming with friends.